There are seven hotels in Korcula. If you choice for the accommodation is hotel it is hard to make the decision but I would recommend Hotel Park, as good value for money hotel or the old-fashioned Hotel Korcula De La Ville. This hotel is situated on the waterfront – Riva , right on the edge of the Korcula Old Town. The sea views and sunsets from its large, convivial terrace compensate for the smallish bedrooms. This is the best place to have your early morning coffee or afternoon tea. Locals are using its terrace for their easy-going early morning or late afternoon cafe-society sessions. As this hotel gets easily oversubscribed, good alternative for Korcula Old Town accommodation is Marco Polo apartments that are located in the very centre of the Old Town. 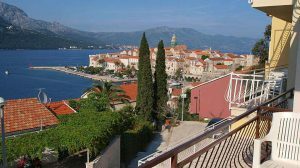 Korcula Villas , Apartments and Rooms – There is a whole range of accommodation in in private houses, villas and apartments in Korcula. Most of the rooms and apartments are of fairly high standard, but there will be some examples of accommodation which is not as good as others. You may also be offered rooms by people waiting outside bus or ferry terminals. If you choose to take a room offered in this manner it is strongly recommended to establish the location of the room and agree on a price before setting off. No matter how you find a room, it is wise to examine it before agreeing to pay for it. If you wish to escape the stress of finding an accommodation upon arrival, you can chose among the our listed accommodation and book it in advance. Note: We also specialize in pet-friendly accommodation. If you have a pet, please write to us for assistance in your search. Or, if you need any personal advise about accommodation in Korcula, or any kind of general advise, please email us. We’ll be happy to assist you in your search. Where to stay on Korcula Island?